The Zodiac X7 Quattro is an inspired blend of sleek design and advanced technology resulting in unparalleled performance. The Zodiac X7 Quattro is an inspired blend of sleek design and advanced technology resulting in unparalleled performance. 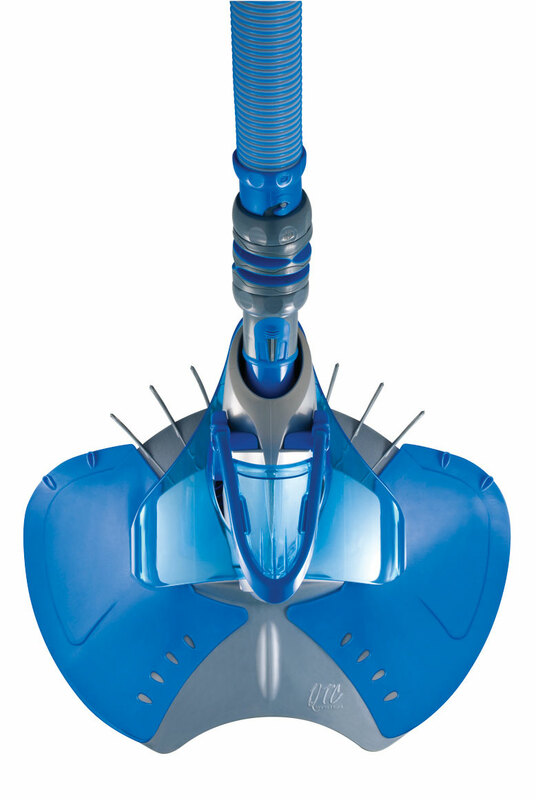 From its innovative QTC System® (Quattro Traction Control) to a completely re-engineered "one moving part" Dura-Life Diaphragm, the X7 Quattro stands alone as the cutting edge solution for pool cleaning. Powered by your pool’s existing filtration system, the X7 Quattro has the agility to climb 90-degree sheer side walls and the mobility to navigate pool surfaces faster, quieter and more efficiently. Hydro Wings - This unique stabilizer enhances navigation, creates a downward force for additional traction and cleaning efficiency. 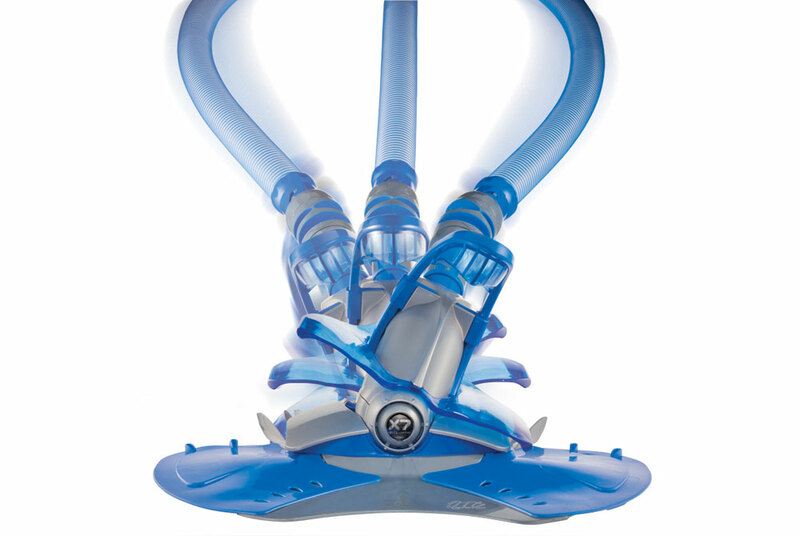 Flex Connector - Flexible hose attachment that minimizes the influence of the hose on the cleaner movement, thus improving coverage. Dura-Life Diaphragm - Designed with over-molded reinforcement for the ultimate in diaphragm durability. 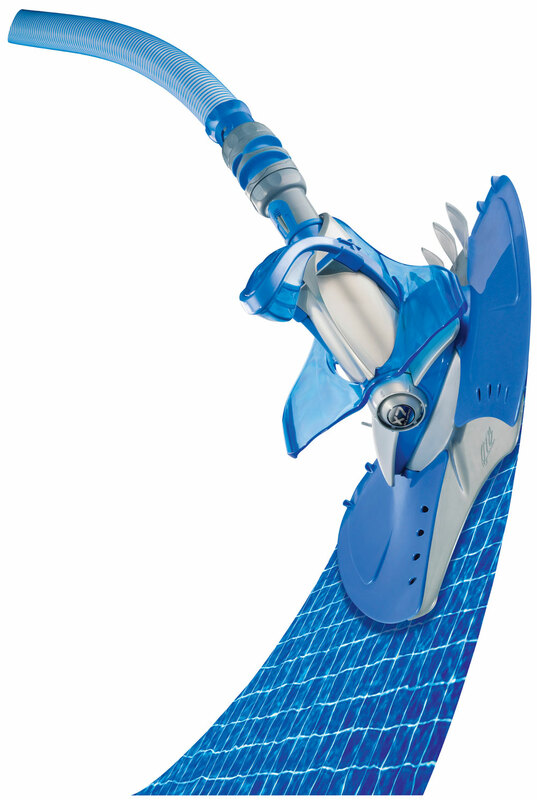 Tilt Action Rudder - The body of the X7 Quattro is uniquely designed to swivel fully from left to right allowing for a new level of agility and mobility in navigating tight areas in the pool. Twist Locking Host - Provides secure connection and reduces vacuum loss. Click a frequently asked question below to see the answer. Could I break the pool cleaner if I disassemble it to check the diaphragm? No, the unit is easy to disassemble. There are a few threaded components to remove by hand. Is there an adapter that connects the hoses to the pool cleaner? The hoses do not fit. No adapter is required, the hoses will fit onto the OEP with a little push. My Cleaner climbs walls excessively? 1. Using Flow Gauge as guide, reduce flow to the cleaner. 2. Verify correct hose weight position. Try moving hose weight further away from cleaner head. Note: If the cleaner is moving extremely fast or climbing the pool walls that is an indication that the flow is too high and the Flowkeeper setting must be reduced. To adjust the flow, pull the adjustment handle on the Flowkeeper Valve to raise or lower the flow rate. 1. Use Flow Gauge or Pool Pulse to insure proper flow. 2. Using Flow Gauge as guide, increase or decrease flow on FlowKeeper valve. 3. Check swivel on cleaner. Swivel should rotate freely. My Cleaner won't leave the edge or rim of the pool? 1. Using Flow Gauge or Pool Pulse as guide, reduce flow to cleaner. 2. Utilize return flow to move cleaner. 3. Confirm that the hose weight position on the hose is correct. Adjust if needed. My Suction Cleaner Stops and Starts? 1. Check if any debris is stuck in the diaphragm hose, skimmer basket and the hair and lint pot in the filtration pump. 2. Use Pool Pulse or Flow Gauge (supplied with suction cleaner) to determine the proper flow. 3. Using the Pool Pulse or Flow Gauge, make the necessary Flowkeeper valve setting changes. 4. Check hoses for leaks and splits. 5. Ensure the pump is on high speed. My Cleaner isn't covering the opposite end of the Pool? 1. Add return diverters or divert return inlets downward. Use return flow to move cleaner. 2. Confirm proper hose length - add 1 to 2 hose sections. 3. Verify correct hose weight position. 45-degree angle to the cleaner and the bottom of the pool. My Pool Cleaner seems to be moving backwards, is that normal? All suction pool cleaners with diaphragms move backwards. The diaphragm pulsates moving the cleaner backwards to the hose assembly. My Suction Cleaner is patterning? 1. Direct return inlets down. Add a return diverter if necessary. 2. Lay hose in a straight line in the sun for a few hours to relax the memory. 3. Confirm proper hose length - add 1 to 2 hose sections. 4. If hose weight required, verify correct position. Note: A properly balanced hose will create a 45-degree angle to the cleaner and the bottom of the pool. Why do I have to take out the diaphragm on a new pool cleaner? To reset the diaphragm to its correct length and assist with start up problems.